You Save: $22.96 (82%) Ships in 1 day. Soft Cover, 320 pages, 5.5 x 8.5. 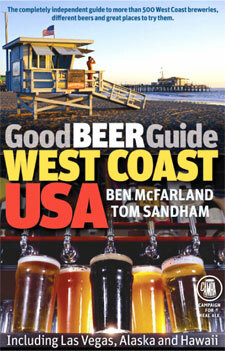 This definitive independent beer guide for visitors to the West Coast, as well as toLas Vegas, Alaska, and Hawaii, features detailed descriptions with photographs of more than 20 of the most common American beer styles, information on travel, accommodation, and beer festivals, and "beer routes" for planning complete vacations. As the place where American microbrewing was born, the West Coast has become the epicenter of a brewing revolution. America is now home to more beer styles than anywhere else in the world and our flourishing brewing industry has a growing reputation for quality and innovation. This authoritative and entertaining guide to the breweries, brewpubs, and bars of the West Coast, Alaska, and Hawaii, is written by two experienced British beer writers who have spent considerable time traveling in the U.S. and developing an infectious enthusiasm for our exciting beers and brewing scene. Also included are sections on West Coast history, American brewing, and the story of the brewpub. Ben McFarland is a travel and drink journalist for Beers of the World, Celebrator, the Guardian, the Independent on Sunday, Loaded, Theme, Wine & Spirit, and others. He was twice named the Beer Writer of the Year by the British Guild of Beer Writers. Tom Sandham is a drink journalist and has contributed to Class and The Publican.